Frank Griffin was born and raised in Indianapolis Indiana. As a youth he grew up under the ministry of the Honorable Bishop Morris E. Golder and as an adult he served under the ministry of the Honorable Bishop Charles A. Sims. A graduate of Purdue University with a B.S. degree in electrical engineering, he also received a MBA from Purdue Krannert School of Management. Dr. Griffin has his masters and doctorate degrees in theology from Calvary Midwest Bible College. 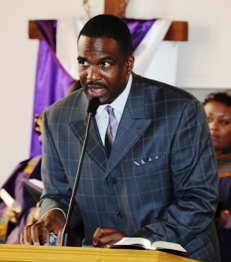 For over 13 years, Dr. Griffin served as youth director, church administrator, deacon, trustee, director of finances, director of men’s ministry, Sunday school teacher and assistant pastor. Dr. Griffin has also taught classes at Calvary Midwest Bible College. Involved in several mission trips, Dr. Griffin has traveled to the Philippines, Nigeria and Cameron. Heavily involved in his local community, Dr. Griffin is a member of the Bartholomew County School Corporation Diversity Council. He served as the president of the Bethesda House, a not for profit project that provided housing and help for individuals transitioning from incarceration back into society, as well as individuals with addition problems. He also served on the board of directors for the YMCA of Worcester Massachusetts. Dr. Griffin is currently the chair of the Dr. Martin Luther King Community Breakfast committee, which coordinates a program to celebrate the life and legacy of Dr. MLK, as well as provide a free hot breakfast for the community. On November 2010, Dr Griffin and family started Thy Kingdom Come Ministries, in Greenwood Indiana. Within three years, the congregation was able to purchase a church and five acres of land. Dr. Griffin has been married to his beautiful wife Debra since 1990 and is the proud parent of two great daughters –Lauren and Tabytha.